LeEco is on an expansion spree in the US, exploring both brick and mortar retail stores and e-commerce channels. The Chinese technology behemoth has now opened an official Amazon store to sell its smartphones and TV sets. 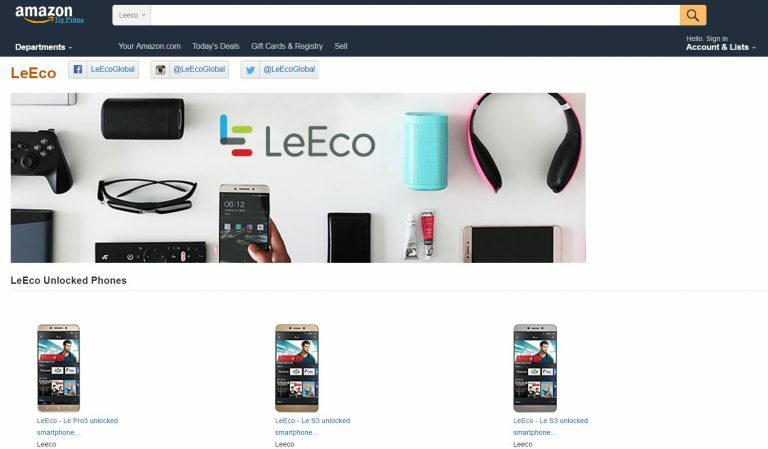 Though LeEco products are sold at Target and Best Buy, opening an Amazon will be a business advantage given the popularity of the platform. The devices featured on Amazon US include Le Pro 3, priced at $399, Le S3 priced at $249, 43-inch smart TV at $449, 55-inch TV at $699 and the fancy 65-inch version that is steep at $1,099. LeEco’s LePro 3 and Le S3 has won rave reviews for its impressive hardware and pricing. The LE Pro3 for instance sports a 5.5-inch 1080p display, a metal body and a powerful Snapdragon 821 processor. At just 7.53mm thick, the Le Pro3 is also among the thinnest 5.5-inch Android smartphones. It has a decent juice pack of 4070 mAh. The Le S3 on the other hand boasts a 5.5-inch FHD display, Snapdragon 821 CPU and 4070 mAh battery. LeEco is betting on the long run, competing with some of the bigger heavyweights such as Apple and Samsung. The company’s interests span from internet TVs and smart gadgets to e-commerce and internet-linked electric cars.